Leonard Riggio is the founder of Barnes & Noble, the country's largest brick-and-mortar bookstore chain. Len Riggio's roots in bookselling date back to his job as a bookstore clerk in college, and for much of his career was on the forefront of bookselling innovation. Riggio was born in the Little Italy neighborhood of Manhattan, New York City on February 28, 1941. The son of a dressmaker and prize fighter (who also drove a cab), from the age of four he grew up in Bensonhurst, Brooklyn in close proximity to an extended family. In grammar school, the young Riggio skipped two grades, entered Brooklyn Technical High School at age 12, and graduated in 1958. He entered New York University and began studying metallurgical engineering, then business, at night. While Riggio attended NYU, he worked at the university bookstore in Greenwich Village, at first as a clerk making $1.10 per hour. Eventually, he was promoted to assistant manager at $140 a week. In 1965, while still attending NYU, feeling dissatisfied with the way the bookstore was being run and convinced he could do a better job, he scraped together $5,000 and opened a competing bookstore around the corner. He called the store the Student Book Exchange (SBX). The Student Book Exchange thrived and within a few years, Riggio had expanded the business to six college bookstores on the East Coast. In 1971, he acquired the musty, failing half-century-old Barnes & Noble bookstore on Fifth Avenue and 18th Street for $750,000 and transformed it into "The World's Largest Bookstore," with 150,000 textbook and trade titles. Already having a reputation for providing a wide assortment of titles, in the mid-1970s, Barnes & Noble also began their reputation for discounting. Riggio opened a 40,000 square feet Sale Annex across the street from the Fifth Avenue flagship store. The Barnes & Noble Sale Annex stocked remainders and other bargain-priced books and their slogan was, "If you paid full price, you didn't get it at Barnes & Noble." Riggio continued to expand his number of college bookstores and his bookstores modeled on the Sales Annex, as he also acquired small bookstores and bookstore chains, including B. Dalton. Through the years, he acquired hundreds of bookstores and, following the store model developed by Borders, launched the Barnes & Noble superstore concept with upscale fixtures, in-store coffee bars, and plenty of places to park and read. In the 1970s, an acquired business expanded the Barnes & Noble reach to mail-order customers, and B&N began to publishing book their own books, like the million-copy seller The Columbia History of the World by John Garrity. In 2003, the company acquired Sterling Publishers. As the bookselling business moved online because of Amazon.com, Riggio launched barnesandnoble.com. As the e-book revolution took hold, he developed the Barnes & Noble NOOK e-reader and the e-book business, which includes PubIt!self-publishing service that gives authors the ability to publishing their own e-books and make them available through bn.com. (In 2013, PubIt! was updated and renamed to NOOK Press. In 2010, Publisher's Weekly named Len Riggio "Person of the Year" for his contributions to the book publishing industry. "My nationality is New York City." "There are 30,000 mini-delicatessens in American bookselling and we are the only supermarket." "Any business created before 1997 is going to be a fossil by the year 2010." "The result [of the 2008 financial crisis] will be a "Darwinian" environment (only the fittest will survive), and the retail species will have to adapt or face extinction. We have and will continue to adapt, and we plan to be around for a long time." Riggio devotes much of his time to public education, lecturing regularly at college campuses, delivering commencement addresses, and serving as a Member of the Board of the New York Fund for Public Schools. Riggio led the nation's first-ever private endowment for a public high school, his alma mater, Brooklyn Technical High School. He has been inducted into the Academy of Distinguished Entrepreneurs at Babson College and the Texas A&M Retail Hall of Fame and holds honorary doctorate degrees from Long Island University, Baruch College of the City University of New York, and Bentley College. 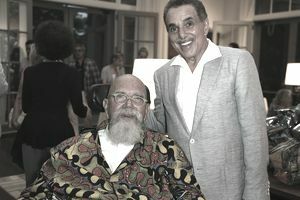 Len Riggio has been involved in many philanthropic causes. He served as the Chairman of the Dia Art Foundation where he led and funded the effort to build Dia:Beacon, the highly respected large-installation art museum. He has served on nearly two dozen not-for-profit boards including the Children's Defense Fund, the Black Children's Community Crusade and the Italian American Foundation and has received numerous awards for his cultural and charitable efforts, including the Ellis Island Medal of Honor, the Frederick Douglass Medallion, and the Americanism Award, the highest honor bestowed by the Anti-Defamation League, which acknowledged Riggio's work "to celebrate diversity and make the dream of freedom and equality a reality for so many Americans." On April 27, 2016, Riggio, announced that he would retire as Chairman of the Company following the September 2016 annual shareholder meeting September, and stated his intention to remain on the Barnes & Noble Board of Directors.